A boy playing in front of a local temple. 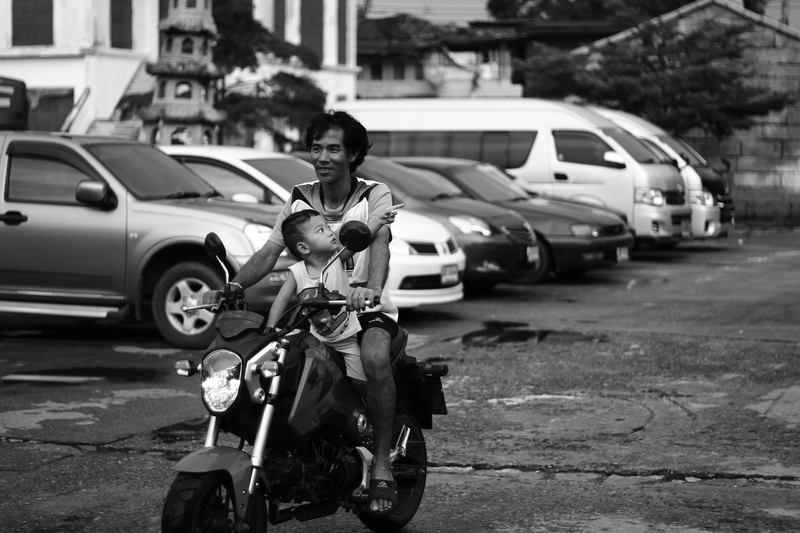 There were many small Wats (temples) around Bangkok, and the empty parking lot here became a gathering spot for women and a playground for kids. As I was walking around this small town, I saw him many times going back and forth the same roads he’d ridden before. I think he was taking his little son around the neighbourhood. 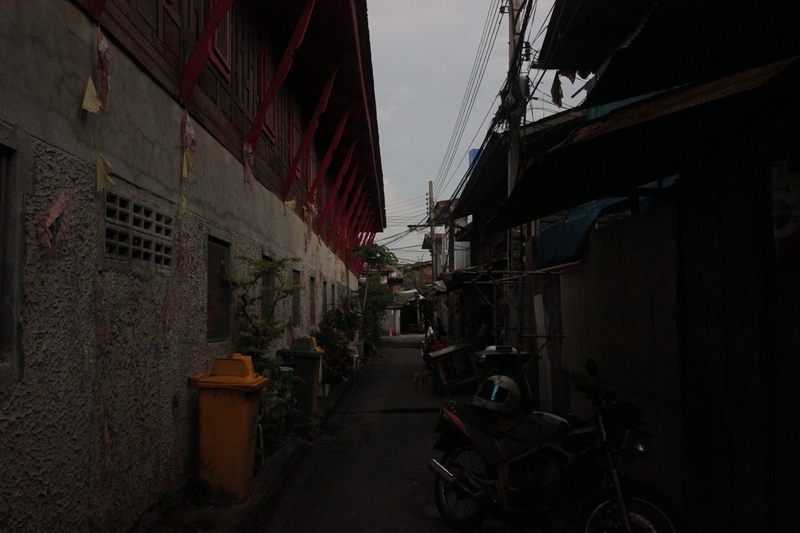 I peaked inside open doors and windows whenever I walked through these narrow alleyways. Kitchen utensils, TV, stationaries, clothes.. Everything you’d need in a household would be piled up in every corner of these rooms, as if the whole family was living in one room. They would always be completely dark, without any electric lights. Many young boys in orange could be seen in and around this beautiful white building. Sort of a monk-school, perhaps. 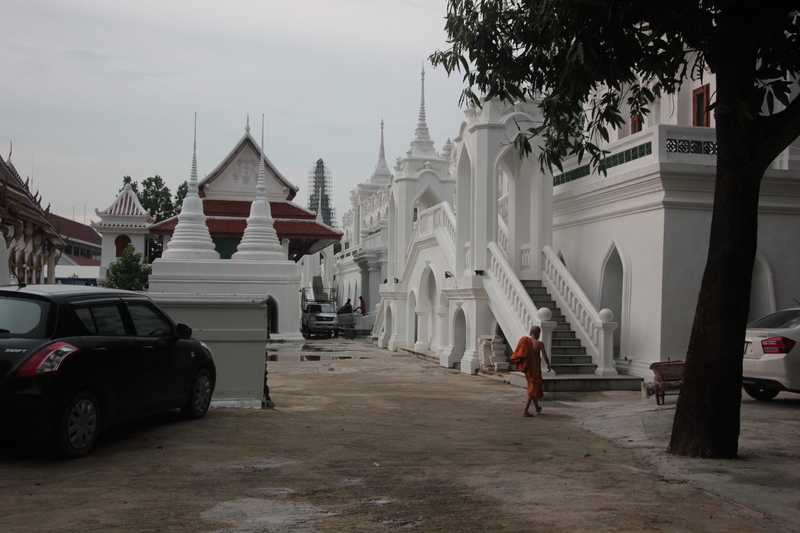 Walking around the Temple of Dawn, Wat Arun: Day 1 in Thailand. With no set itinerary planned after seeing the Reclining Buddha, we impulsively decide to cross the river and take a walk to wherever it takes us. Tha Tien Pier is the nearest spot to take a boat, and getting there feels like a mini-adventure of its own. We walk through rows of vendors selling dried sea food, curry paste, salted fish and other exotic foods I have never seen before. 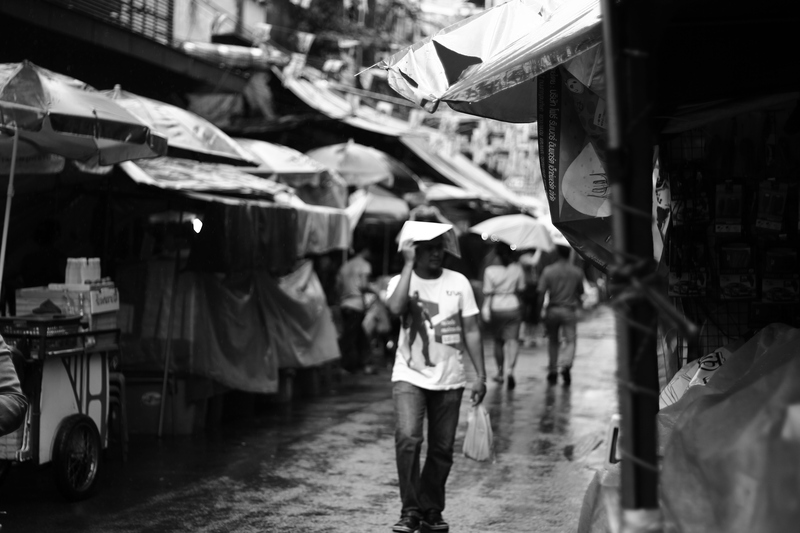 It’s Tha Tien Market, a wet market that has evolved from a community of floating households. Today it developed into clusters of roofed area which protects their produce from rain. but nonetheless, the floor is wet. We walk through the narrow paths, turning our bodies left and right to weave through the haggling crowds. The air is salty with smells of fish and squid. We see spices in bright orange, red, and brown. The deeper we walk into the market, the darker it becomes as the clusters of roofs become denser. After passing a few eateries- still in darkness – we pay a small fee for the boat from a scrawny man at a tiny cell-like ticket booth, pass the revolving barrier gate and voila! Back to sunlight. 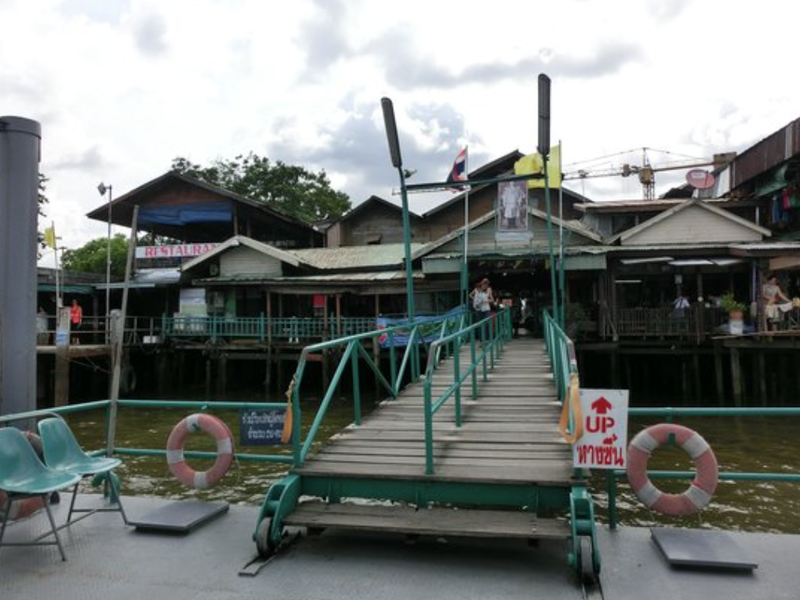 A short one it may be, but the boat ride across Chao Phraya River is a welcome breather from the hustle and bustle of the crowded market few minutes ago. The boat takes us to Wat Arun temple, but it’s what lies beyond this famous temple that steals my heart away. We are met with an eerily quiet neighbourhood – lanes laid with well polished, pastel coloured stones, occasionally its peace interrupted by a motorbike or a tuk-tuk. 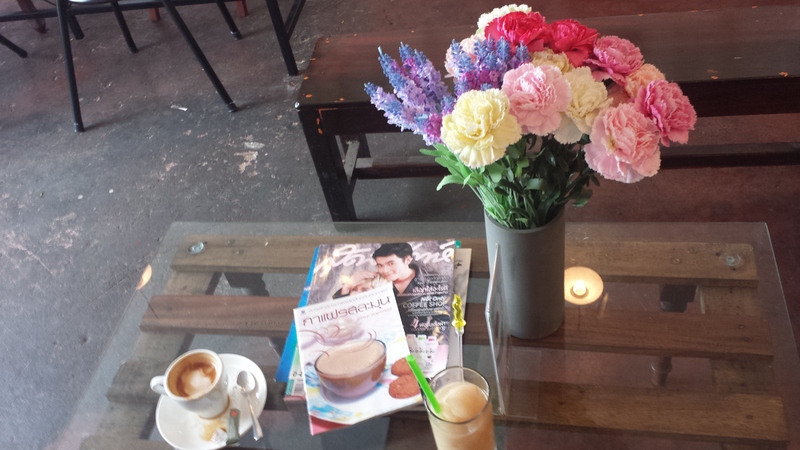 The main road (Wang Doem Road) is lined with small local eateries, as well as western cafes that feels artsy and hipster. We take a break in one of these small places and share a banana toast. Despite it being a simple toast with sliced bananas and syrup on top, it takes a long time to be prepared. The whole neighbourhood is full of quirks. A canal is running in between rows of houses, and pots of plants are bursting everywhere, completely transforming the town made out of rusty corrugated metal roofs, iron pipes and grey concrete floor. Despite all these signs of life – laundry hanging, aroma of food filling the air, young children occasionally appearing and disappearing – not much is moving in this quiet neighbourhood. Cars and bikes are parked on the side. There are a few street food stalls but has no customers. A handful of tourists like us are the only ones that’s making a noise here. We wonder around this funny little place, taking in another side of Bangkok that is so different from what we’ve seen in the morning. 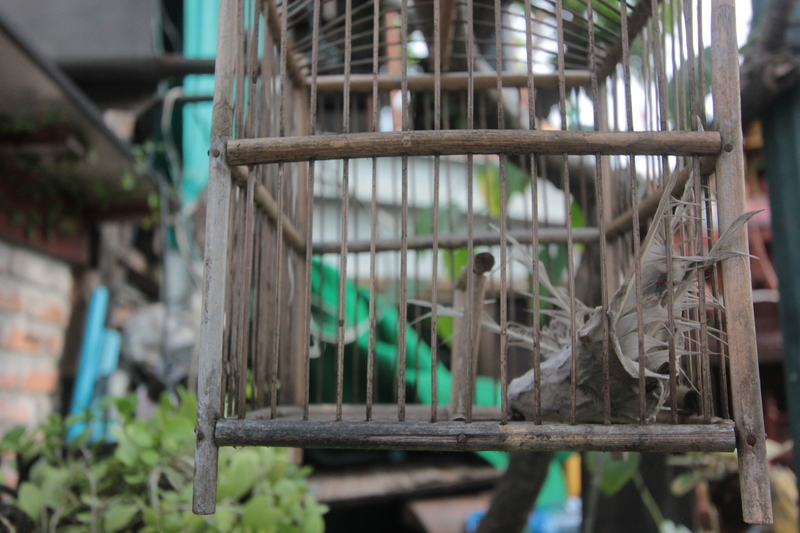 As if the area isn’t quirky enough, I find a wooden bird cage hanging on a tree, with a dried up bird as hard as a stone. Its feathers are too real for it to be a figurine, but its body is too stiff for it to be a real dead bird. It’s a quizzical, odd little town. 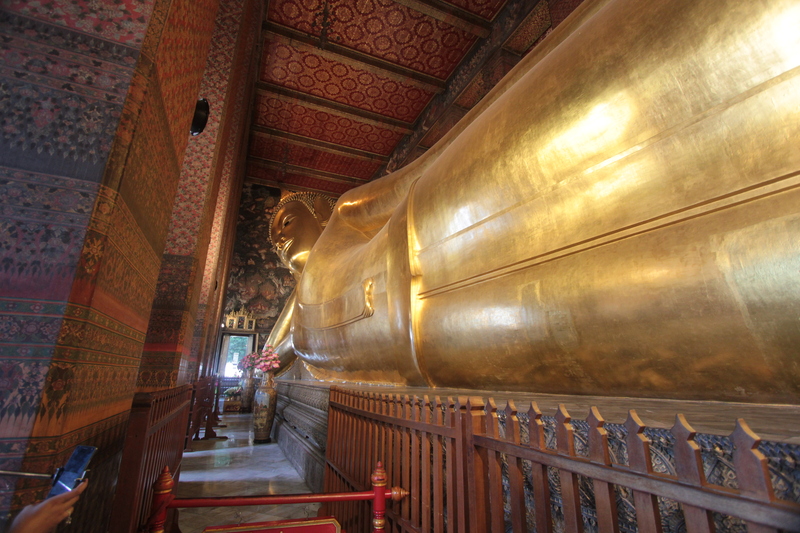 Wat Pho, also known as the Temple of the Reclining Buddha, is on the top list of all must-do’s in Bangkok. The famous Buddha is 46 meters long and is covered in golden leaf. The complex also houses one of the most well known Thai Massage training schools. 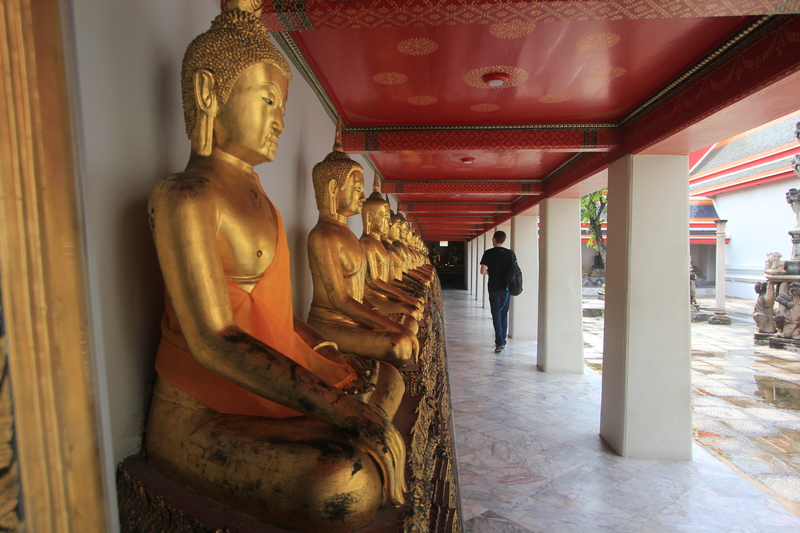 You can read more about getting a massage in Wat Pho here. The complex also boasts the largest collection of Buddha images in Thailand and is the country’s earliest centre for public education. The Reclining Buddha’s iconic position represents the historic Buddha during his last illness, about to enter the parinirvana. The soles of the Buddha’s feet are inlaid with mother of pearl in 108 segments, showing in great detail the 108 characteristics of the Buddha. But this part was closed for viewing due to construction work. Clang clang clang. 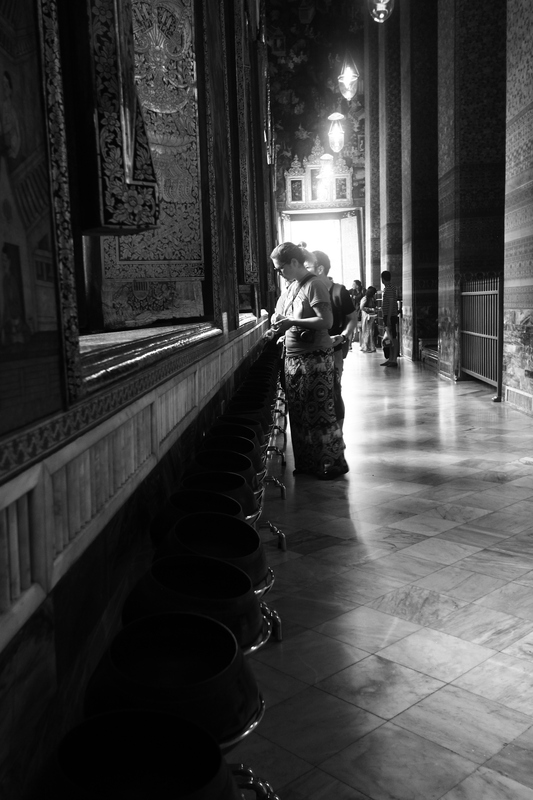 Softened bell-like sounds ring constantly the moment we enter the chapel that houses the largest Buddha statue in Thailand. It’s the sound of visitors dropping coins into 108 bronze bowls in the corridor behind the Buddha, an action believed to bring good fortune. Day 1. 1 October 2015. Bangkok, Thailand. 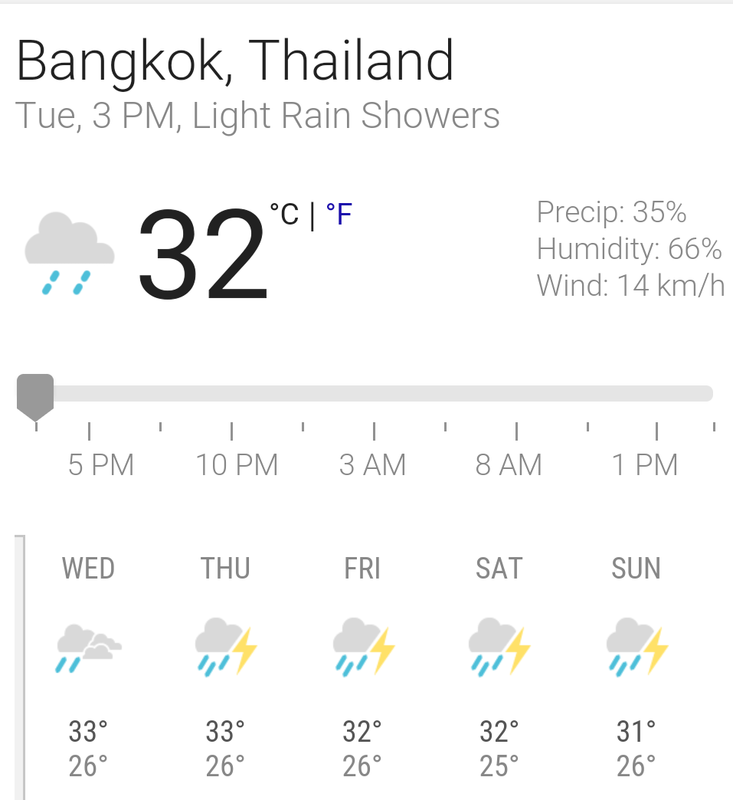 Bangkok is pouring, pouring pouring: Day 1 in Thailand. Fully exploiting the public holiday in Hong Kong, off I book a flight to Bangkok…only to find out it’s the rain season. But it doesn’t dampen our spirit. With two umbrellas packed, it won’t be much of a problem. The morning of the first day is cloudy but dry, and we take a taxi towards Wat Pho and find a fast food place for our brunch. It’s too late when we realise that we left our umbrellas back in the hotel by the time it starts pouring down with rain during our meal. 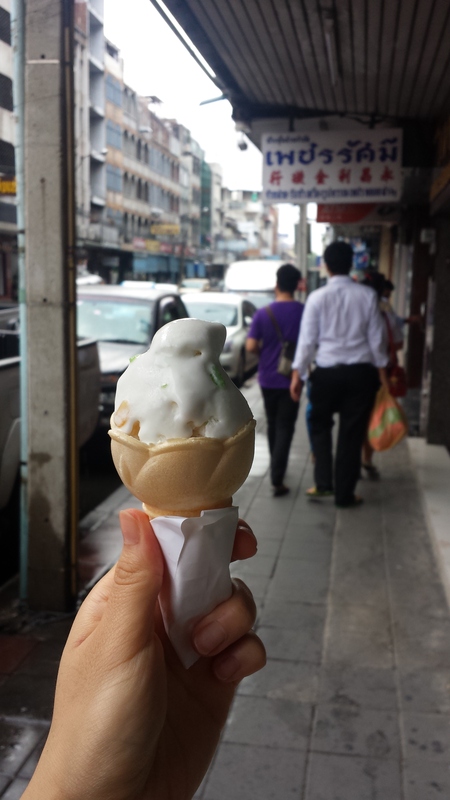 We walk one way in rain, hoping there’d be a store selling umbrellas, but the street doesn’t seem to have such shops. So we walk back, remembering it was a bit busier than this one. The rain doesn’t seem to be getting any lighter, so I take shelter under a small canopy of a street vendor while my friend goes into the market to find an umbrella. 10 minutes? 15 minutes? I don’t know how long I stood there waiting. Bound by the rain, I have nothing else to do but to people watch. The locals seem to be used to this kind of weather. 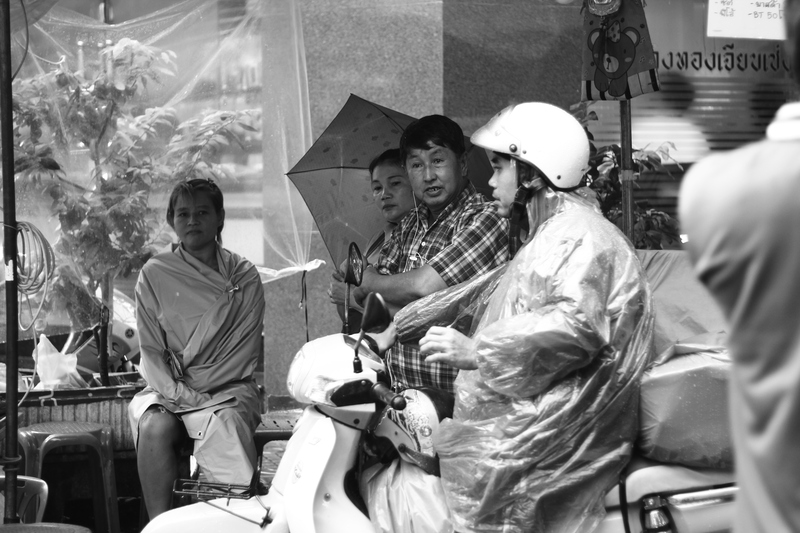 The sellers have swiftly and deftly covered their stalls with canvas sheets, and the motorbike riders are wearing baggy raincoats made out of thin plastic sheets. The sky is grey, thick and heavy , but it doesn’t make Bangkok grim one little bit. It’s a city full of colours – taxis are fuchsia pink, tuk-tuks green, and buses orange and red. Eventually my friend returns, but with an empty hand. By now our hair’s wet and shoes are soggy. 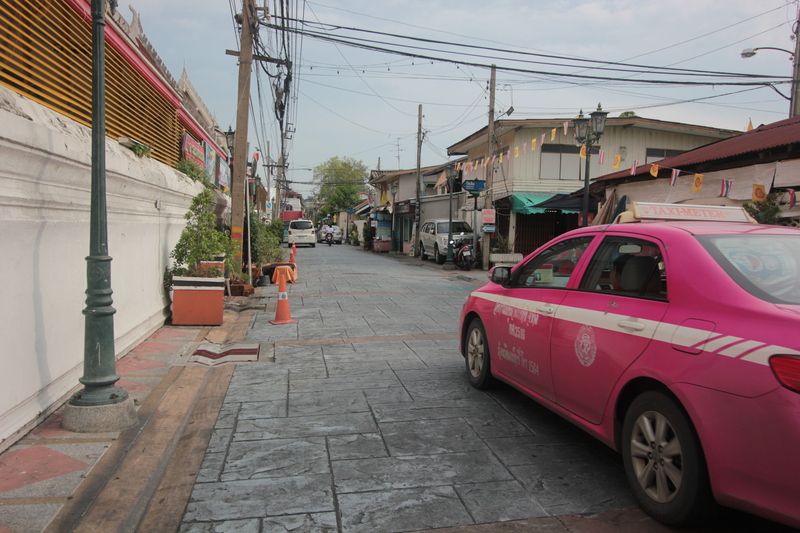 “Should we just take a taxi to Wat Pho?” We discuss as we turn off the road from the corner I had been standing. 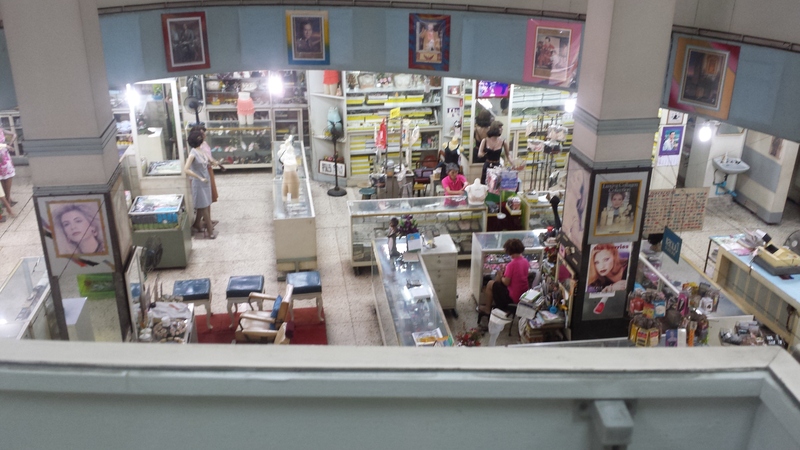 And there it is, an entrance to a big retro department store. And yes, they sold umbrellas.